Hey there! June marks the end of school for your little ones, which is of no great loss to any child who is excited for the long days of summer, marked by swimming, playing with friends, vacations with the family and relaxing with friends. Even though they're excited to end another school year, you may be thinking what you can give to their teacher (or teachers) to thank them for all the work they do every day for nine months--planning, grading, managing 35 children all day long--often with no other adult contact. It can be very exhausting, but worth it when making connections with students. How do I know? I teach! And, although I love my kiddos, I too am relieved we get a break for 12 weeks. 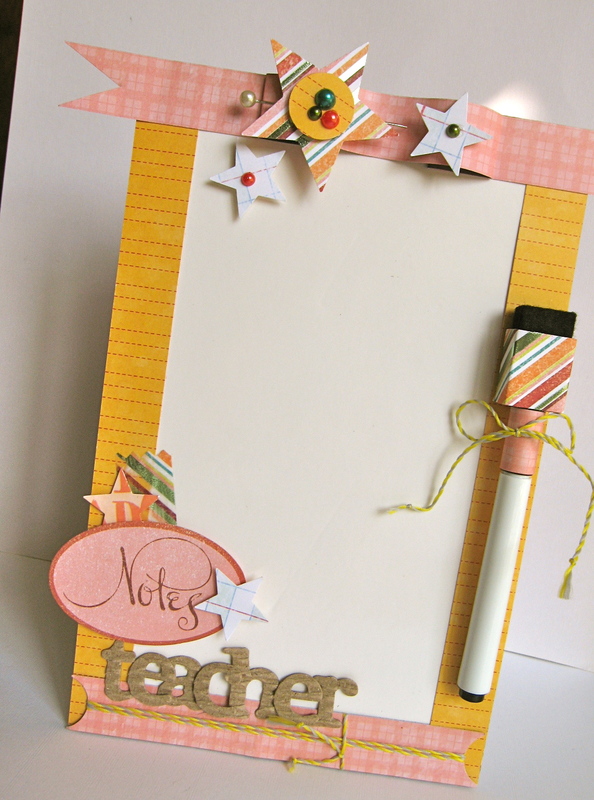 Make sure to thank your child's teacher with a handmade gift from the heart. The project I'll be sharing with you today is gift set for a teacher! The idea came to me when I was at the office supply store buying ink, and saw the cutest little whiteboard! I loved the size of it and it had a small border that I could easily cover. I knew that SEI's mid-release Mayberry would work perfectly with the mini whiteboard and clothespin. What I love about SEI's collections is that they are versatile for any occasion. This collection appeals to men, travel (a la summer vacation) and even teachers, with it's reds, golds, pretty greens and warm yellows. I chose three patterned papers from Mayberry to decorate the border and the edges of the whiteboard. I bent a patterned paper strip to create a faux ribbon look at the top, and then some punched stars to embellish it. I then added two strips along the sides and softened up the harsh lines with a little twine at the bottom. The pen looked a little out of place so I added a paper strip to the cap and affixed it to the side of the board so it fits in perfectly! I love creating a little dimension on my projects and with SEI's foam tape you can make certain elements like the stars stand out. Make sure to use the right thickness of foam tape on your project so that the teacher can actually write on the board, without snagging a star embellishment. The fun thing about the board is that it's a magnetic whiteboard and can attach to a file cabinet in a classroom, or you can adhere it to a wall. The clothespin was something that I picked up in the dollar bin at Michael's months ago. It's thick and sturdy, good for holding papers. You could affix a magnet to the back of it and the teacher could use it on a large whiteboard to hold papers, or it could also be used by a teacher to hold papers together to be graded. 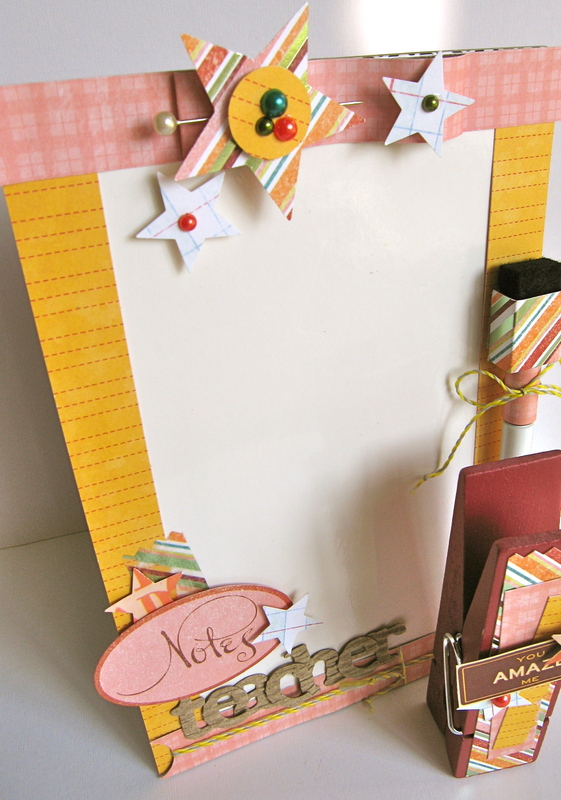 I added some coordinating patterned paper strips that were used to embellish the magnetic board. One cute feature of the new Mayberry collection is that it has this great double-sided perforated sheet with license plates on one side (travel) and cute sentiments on the other---they were the perfect size for the clothespins had a great variety of sentiments to choose from, all you need to do is punch it out! 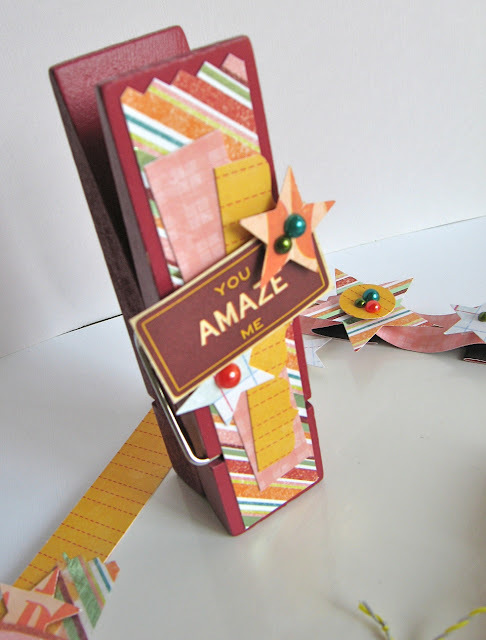 This is a quick and easy project to make (I made both of these in about an hour). 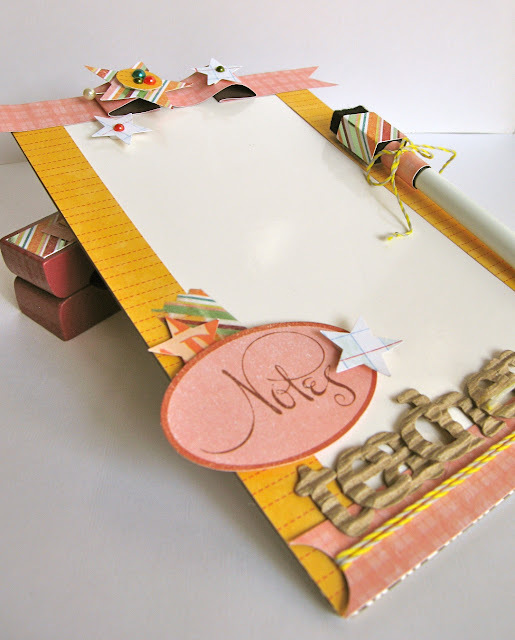 You could even have your child help make this gift by adhering patterned paper strips, punching starts and placing them onto the board and clothespin with foam tape, and even writing a cute message to their teacher with the whiteboard pen! SEI's newest collection, Mayberry will hit your stores soon, so make sure to grab this one quick so you can make your Teacher Appreciation gifts! HOOOOOOORAY for summer break! I hope this means we get to skype soon???? 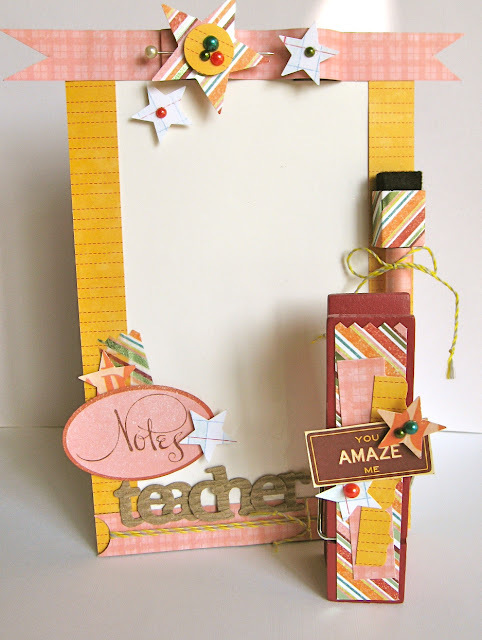 I'm loving the papers and designs of your teacher appreciation gifts! This is awesome! I love what you've done with the whiteboard. And yay for summer! !